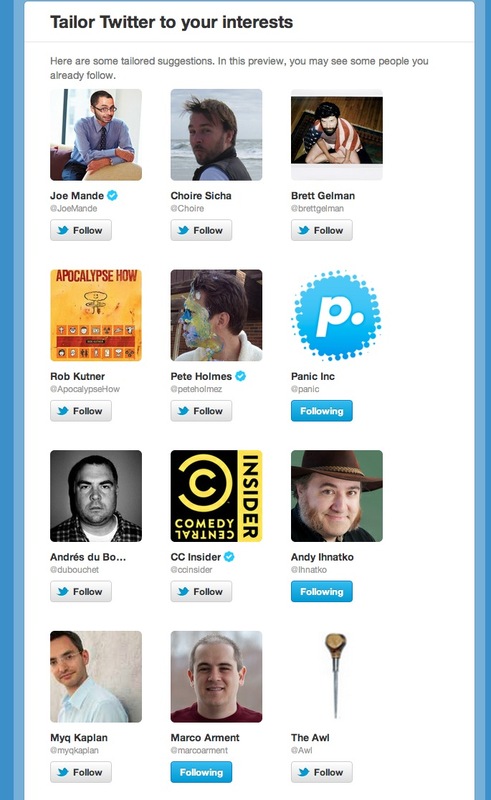 Twitter has today announced that it will be giving new users a custom-tailored list of suggestions for who to follow. This should help to improve the amount of new accounts that people follow as they will be more inclined to like their choices, rather than the ‘generic’ ones provided before. What they’re going to do is show new users a list of follow suggestions on the left and a timeline that shows off the tweets from those users on the right. 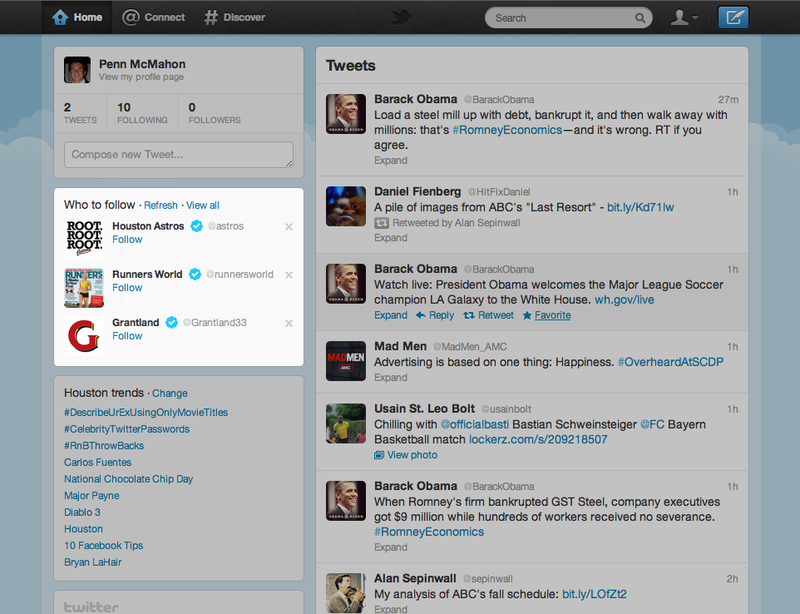 This should give new users a ‘full Twitter experience’, aka a full timeline, right from the get go. 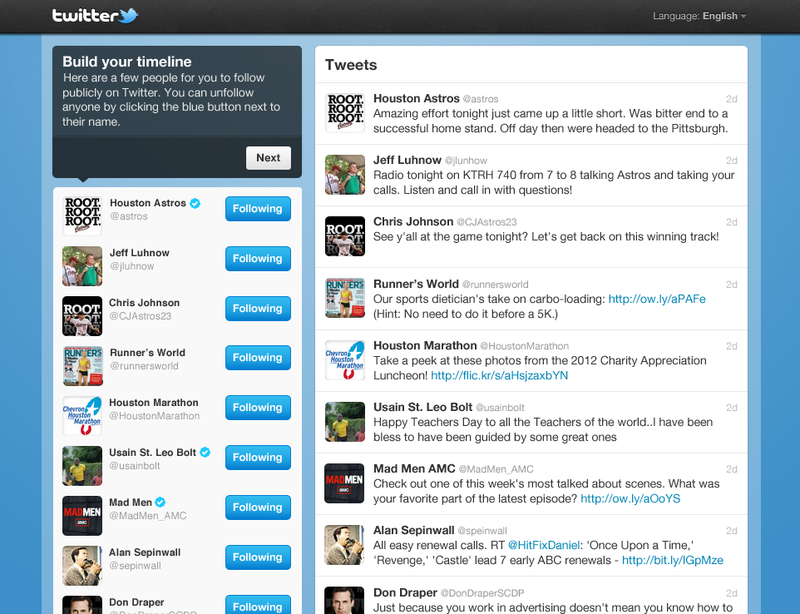 Current users will get a custom list as well, which will be displayed in your ‘Who to Follow’ box. Twitter calls this an ‘experiment’ in ‘tailored suggestions’ so it will only be available for some users right off the bat. If you’d like to take part in the experiment, you can see what they’re up to by opting in here. Twitter will collect information based on the sites that you visit which have Twitter buttons or widgets, so if you feel uncomfortable with that, don’t do it. We receive visit information when sites have integrated Twitter buttons or widgets, similar to what many other web companies — including LinkedIn, Facebook and YouTube — do when they’re integrated into websites. By recognizing which accounts are frequently followed by people who visit popular sites, we can recommend those accounts to others who have visited those sites within the last ten days. New users will get an option in the startup process called ‘Tailor Twitter based on my recent website visits’ and existing users get a ‘Personalization’ section in their account settings. Both can be disabled at any time. I tried it out myself and got a pretty solid list. Some of the accounts I already follow, which Twitter says may happen. But there were few on the list that I would say ‘missed the mark’. This move shows off Twitter’s further efforts to build engagement and increase the value of a user’s Twitter account, making it personal and full of interesting content. I discussed the company’s efforts to do so with its new weekly email digest here. As Twitter expands from a role as a ‘nerd watercooler’ into an information pipeline and social service, it’s trying to make the transition from hundreds of millions tobillions of users, and the digest is a smart move. It’s an educational tool and, from the ones I’ve seen so far, is formatted and presented beautifully using a tool built by the recently acquired Summify. Earlier today, Twitter revealed that it was supporting Mozilla Firefox’s Do Not Track initiative, allowing users to opt-out of tracking for any purpose, including advertising. This new feature will obviously not work if users choose to turn this option on. Twitter has also posted a support note that says it will support all browsers with a Do Not Track mode, including Internet Explorer, Safari and Chrome (with an add-on).